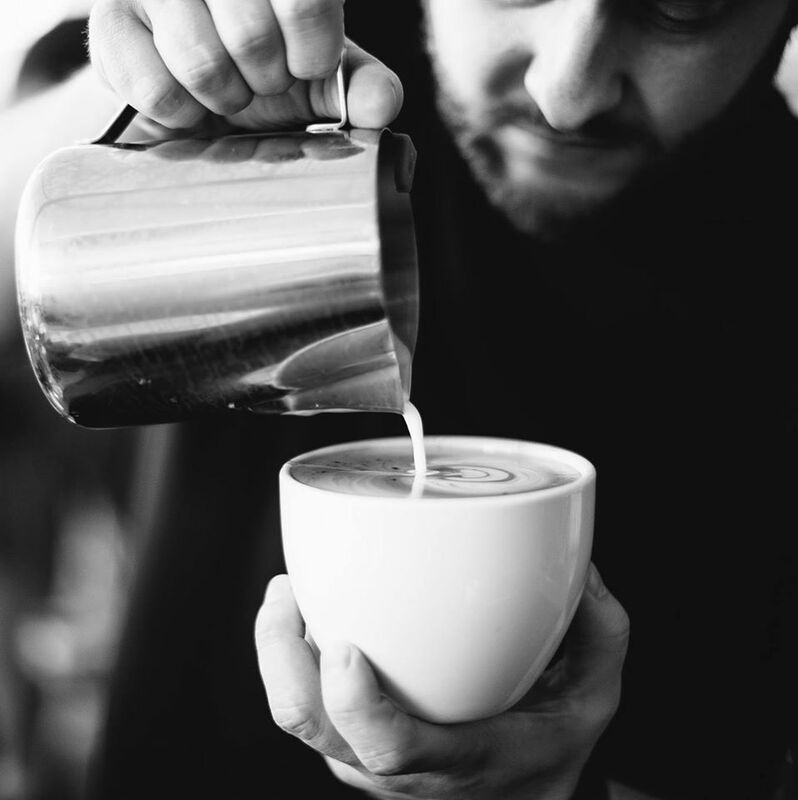 Frank Reber is a musician, recording engineer, culinary enthusiast, barista trainer, coffee educator, coffee roaster, and small business owner residing in Muncie, Indiana. Frank graduated with a bachelor’s degree in telecommunications, with a focus in audio production from Ball State University. In 2011, Frank served as an intern at Steve Albini’s Electrical Audio, in Chicago, where he learned the art and craft of working with analog recording mediums. It was here that Frank’s focus on the positive impact that imposed limitations can have on creative processes became a driving force for his own writing and recording methodology. In 2012, Frank and his wife, Lauren, decided to donate their time and talents to create the Musical Family Tree Sessions, in which bands and solo musicians were invited to Reber Recording to perform five songs (preferably that had not been recorded before). The sessions were recorded and photographed (free of charge) to be uploaded to the Musical Family Tree website to be enjoyed by the masses (also free of charge). The project was sponsored by Rode Microphones and Sweetwater Sound. The whole project was received with great fanfare and resulted in 40,000+ downloads and streams. In the Fall of 2012, Frank accepted a graduate teaching assistantship at Ball Statue University in Digital Storytelling and Journalism department. He spent a year teaching Post Audio Production to undergrads enrolled in the Telecommunications program. In 2014, Frank and Lauren opened up The Caffeinery; a gourmet coffee shop and tea house in downtown Muncie. The shop is housed in the historic and beautiful Murray Building. It has been received with much fanfare from the surrounding community. Six months after opening its doors, The Caffeinery was selected as one of six contestants for the America’s Best Coffeehouse Competition in Chicago, IL as part of Coffee Fest. Despite only being the youngest shop to compete, The Caffeinery took 4th place in the competition! In 2016, Frank was a recipient of the 20 under 40 award, by Muncie Magazine. Those selected are chosen based on their business success as well as philanthropic efforts to make Muncie and the surrounding area a better place to live. In early 2018, Frank and Lauren decided to jump headfirst into coffee roasting and started Reber Roasting Company. They purchased their first coffee roaster with the goal of supplying 80% of the coffees being offered at The Caffeinery by the end of 2018. Of course, this is no easy feat, considering that the majority of the roasters being featured at The Caffeinery are recognized as the best in the industry. Nonetheless, Frank and Lauren are determined to make a name for themselves and their community by laying the groundwork for a top-notch coffee roasting program. Today the shop continues to thrive as an integral part of the Muncie community with Frank and Lauren working side by side to ensure that their high standards are maintained. The coffee roasting program is progressing as scheduled and some of these coffees are already working their way into The Caffeinery. Together, along with their two dogs and two cats, they are currently working towards building out the future location for their coffee roasting and education facility.